Our travels in Oman took us north from the capital region in Muscat to Sohar, a drive of some two hours along the Batinah Coastal Plain. This coastal plain is just that, a low relief plain sloping towards the Gulf of Oman and underlain by relatively young (Tertiary to Holocene) sedimentary rocks and sediments. The ophiolite forms a distinctive and rugged terrain that rises to the west of the flatlands. As I noted in the last post, the Oman ophiolite is the largest and best exposed of its kind in the world. Wadi Jizzi is the major drainage that cuts through the ophiolite terrain to the west of Sohar and it is here we piloted our modest Toyota saloon (a British word for sedan, also used by Omanis). Shaded relief map of a part of northern Oman. 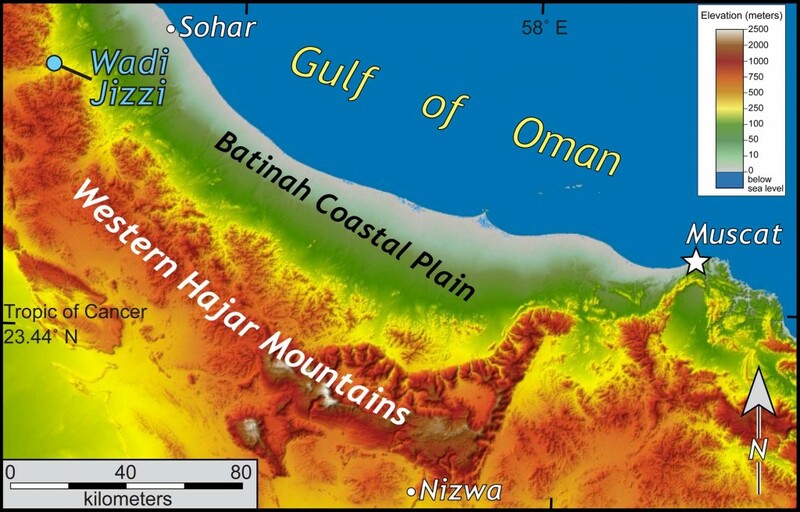 Note the different topography between the Batinah Coastal Plain and the Western Hajar Mountains. 30-m data from the Shuttle Radar Topography Mission. 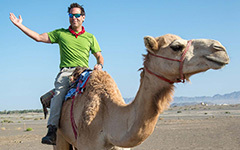 One of our stops is a world classic; the pillow lavas exposed in the cliffs along the south side of the wadi (the arabic term for a valley or riverbed) are nothing less than stupendous. These exposures became famous when they graced the cover of Geotimes magazine back in 1975 and ever since then have been referred to as the “Geotimes” lava or “Geotimes” pillow lavas. I prefer the local name, Wadi Jizzi. Alex Johnson, William & Mary Geology Fellow, standing tall and proud in front of the pillow lavas exposed at Wadi Jizzi, northern Oman. The external morphology of the pillows is evident, but erosion has cut cross sections through individual pillows as well. In external form the pillows are tubes or bolsters, some upwards of 3-meters (10 feet) in length and between 0.5- and 1.2-meters (1.5-4 feet) in diameter. The surface of the pillows is cracked with a series rectilinear cooling joints and green glassy material commonly occurs in the interstitial regions between the pillows. The rock itself is a brownish basalt with no visible phenocrysts or vesicles. Close up of Wadi Jizzi pillows (both external morphology and in cross section). Note abundant fractures. Hammer is ~42 cm (~17″) in length. 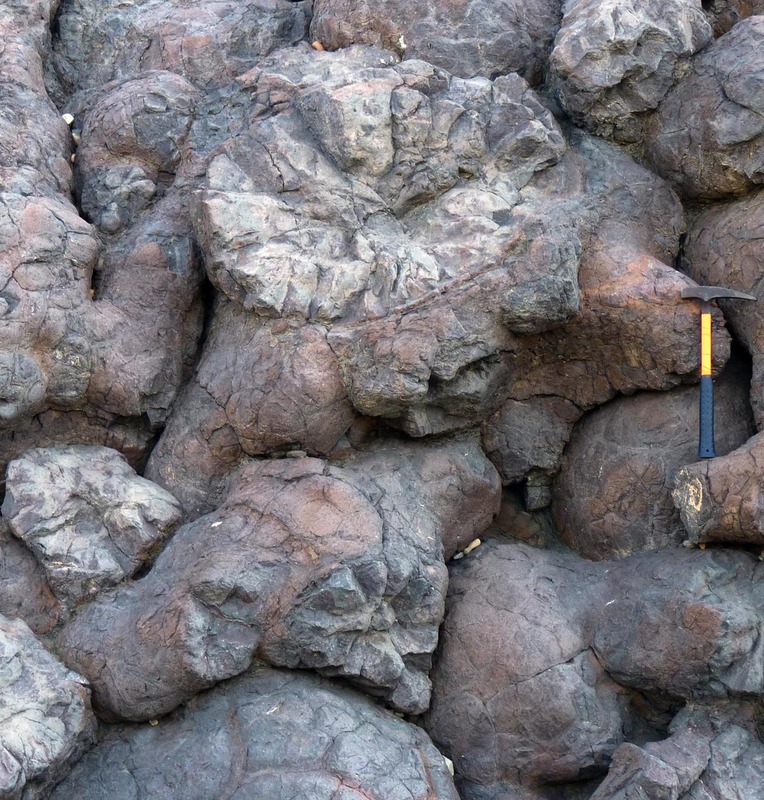 Pillows commonly form when lava is extruded under water. As lava disgorges from its vent on the sea floor it comes in contact with the surrounding seawater that rapidly quenches the lava to a glassy solid, thereby partially clogging the conduit and forcing to lava to ooze out nearby. This repetitive process of extrusion and rapid quenching produces the tube to pillow-like morphology. At the eastern end of the outcrop the pillow lavas are cut by two altered basaltic dikes. The cross cutting nature of the dikes indicates they are younger than the pillows and are likely the conduit by which younger lava was transported to the sea-floor, where it too would have erupted as pillow lavas. The sequence of pillow lavas is interlayered with cherty sedimentary rocks containing radiolarian fossils; the fossil assemblage enabled geologists to date the volcanism and sea-floor sedimentation to part of the Cretaceous period (100 to 95 Ma). These were lavas erupted along a mid-ocean ridge at the bottom of an ancient ocean known as the Tethys Ocean. Tethys was a goddess from the Greek classical period, but more recently her name has been used as the moniker for the ancient ocean that once separated Eurasia from Gondwana during the Mesozoic. Basaltic dikes cutting pillow lavas at Wadi Jizzi. Once again Alex Johnson for scale. Mid-ocean ridges are notoriously difficult spots to reach for field trips, primarily as a consequence of being 1) in the mid-ocean and 2) under a few kilometers of water. But ophiolites bring the mid-ocean ridge to the continents, making it possible to reach the bottom of an ancient ocean while daytripping in a saloon to an Omani wadi. 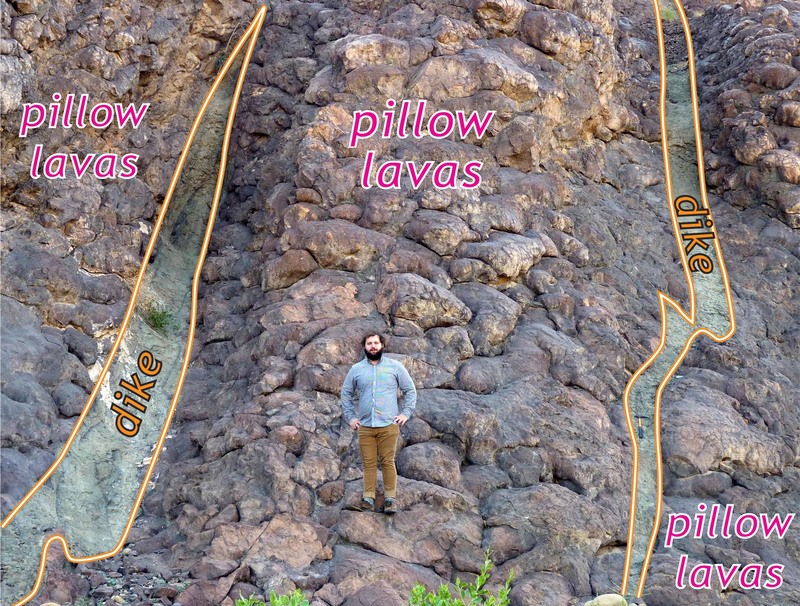 I was reading the paragraph of text below the first map and saw the top of the first pillow lava photograph, thinking that I was looking at a small outcrop…definitely a shock when I scrolled down and saw Alex. That’s HUGE! Hope you’re having fun. Will we be seeing them in higher resolution anytime soon? We are having fun and the pillow lava outcrop demonstrates the need for scale bars! We’ve got a few good Gigapans in the bag, will upload soon. Wow, Chuck. 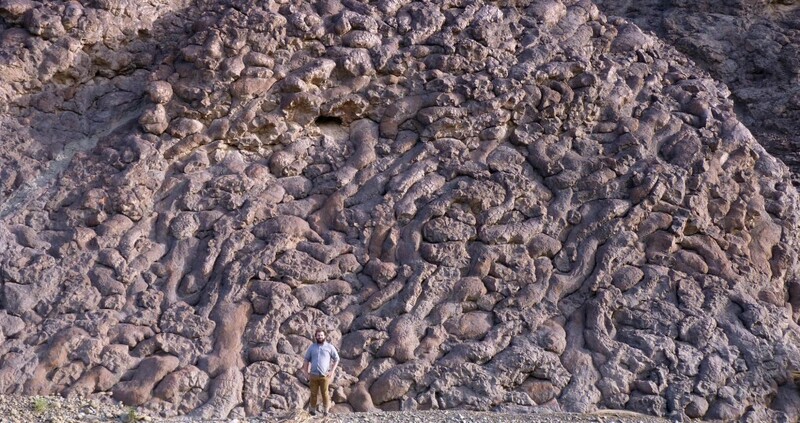 Your blogs from Oman are “stupendous” just like those pillow basalts! !